Clara’s Dream – Sulyma Productions Inc.
Our story takes place one magical Christmas Eve, as the Stahlbaum family is busy finishing last minute preparations for a grand party. A tableau is presented and we see a Vertep, a Ukrainian puppet theatre, where the mysterious Dr. Drosselmeier is entertaining a group of children in eager anticipation of the Christmas Eve celebration that is about to take place. An enchanting city streetscape sees the guests begin to arrive, dressed in their holiday finery. With a flourish of his great black cape, the mysterious Dr. Drosselmeier appears, greeting Ukrainian carolers. His arrival to the Stahlbaum party is magical and he’s brought a doll as a gift, which performs a delightful dance with the children, while a Ukrainian Marionette brings yet more joy to the young ones. However, it is the Nutcracker doll, Drosselmeier’s gift to his goddaughter Clara, which wins her heart. When Clara’s brother Fritz teases her by snatching the Nutcracker away from his sister, Drosselmeier encourages them to gently cradle the Nutcracker doll before placing it beneath the Christmas tree. After the guests leave, Clara creeps back to the darkened parlour to check on her Nutcracker. The clock chimes, striking midnight, and as she peers into the darkness, Clara realizes she is surrounded by an army of menacing mice. A cannon blast downs a battalion of mice while the Nutcracker, now come to life, leads toy soldiers into battle. The fight rages on until the Mouse King corners the Nutcracker in a duel. 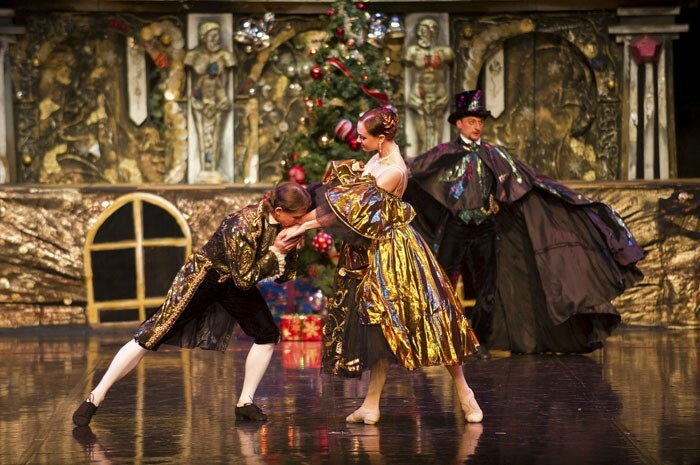 Clara comes to the Nutcracker’s aid and defeats the Mouse King by pulling off his tail. The spell broken, the Nutcracker is transformed to a handsome prince, and he declares his eternal gratitude to the young heroine. He whisks her away to his fantastic fairytale kingdom, far from the mice, the parlour and Clara’s childhood home. Clara and the Prince journey to the magical fairytale kingdom where upon their arrival at his palace they are entertained by his friends with a magnificent dance of Carol of the Bells. Once inside, delegates from faraway lands perform for the pair: elegant Spanish dancers, a mysterious Arabian girl and a merry Chinese trio delight. A dazzling Ukrainian Hopak complete with high kicking Cossacks is presented in a most spectacular fashion. Soon, the Prince asks Clara to join him in a romantic and lyrical pas de deux. © 2019 Sulyma Productions Inc.